A twelve leaf tear-away calendar mouse?mat. Generate your own custom calendar?to any colour or design. Ideal for having?important dates right at your fingertips. This?product has no laminate and is therefore?easy to write on.? 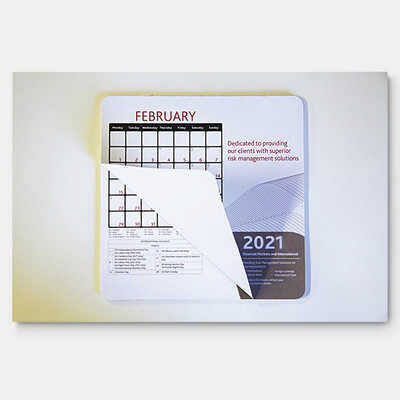 (Calendars are not supplied) Colours: 12 leaves in 4 Colour Process, Dimension: 230mm x 190mm x 1mm Natural Rubber base. Price includes : 7 Day Service 4 Colour Process - One Locatin. Setup is included.